A licensed herbal medicine for the symptomatic relief of coughs and bronchial conditions; an aid to maintaining general health in dogs. 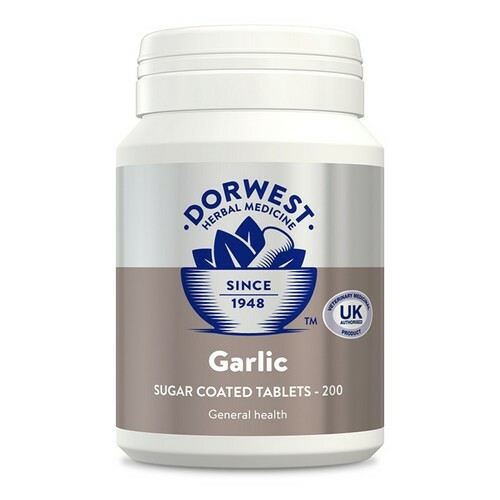 Garlic has antibiotic, antiseptic and anti-viral properties confirmed by modern scientific studies and effective to relieve upper respiratory conditions. It is also well known for its ability to maintain a healthy heart and circulation and for providing an environment that is hostile to parasites. Can be given from 8 weeks of age and can also be used during pregnancy and lactation. Also available in 100 and 500 tablet pots. How Many Garlic Tablets Do I Need to Give? 1 tablet per 5kgs bodyweight daily. Can be given indefinitely for general health. Garlic 30mg; Oil of Garlic 0.001ml.